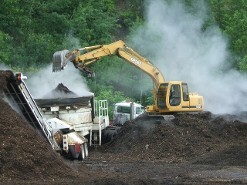 Yard and wood waste is one of the largest categories of solid waste a community generates. 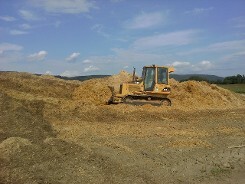 Keep your waste under control with wood waste recycling from McDonald Contracting in Elmira, New York. 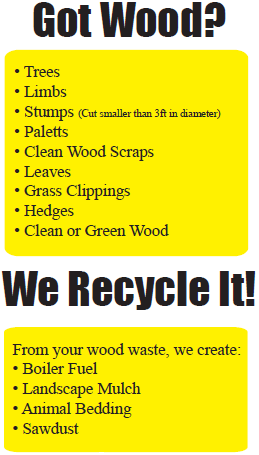 Reduce your wood waste to mulch with our on-site wood grinder services. 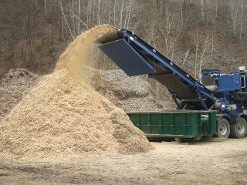 We grind your wood into a suitable product that may be taken away or left at your site for mulch, combining the cost of woodwaste removal and mulching. Our Diamond-Z 4000 Horizontal grinder and 650-hp Diamond-Z tub grinder have the capacity to grind logs and stumps up to 3 feet in diameter! We offer a wide range of services from excavation and sitework to landscaping and materials, septic system repairs, wood waste recycling, dumpsters/containers and more! You have probably seen some of our work at local churches, restaurants, residential properties, funeral homes and community parks. It has been our goal to make our name synonomous with quality. ©2019 McDonald Contracting. All Rights Reserved.